From the other side of the world, from the new year. We have been looking forward to starting the trip and the new year in Sydney, and after two days, it has not disappointed. While I was researching what to do for New Year’s, an ex-St. Stephen’s mom who moved to Sydney gave us the great advice of becoming members of the Royal Botanic Garden and buying tickets to the members’ only NYE picnic. So we bought beach towels at Woolworth’s and food at the market at department store David Jones, both of which were charging NYE tourist prices. The gates to the garden opened at 5pm, and as we were walking to find our spot, we came across a gorgeous tree. I tried to take a picture of it and sadly realized that I left the camera battery in the charger in the hotel room. Nice. The lawn was crowded, but we weren’t on top of each other, and we found a great location. All in all, a civilized, family affair. During our 7-hour wait to ring in the new year, we complained about the sun, lamented the heat (mostly Nati), played cards, recorded video for an upcoming project, did a taste-test for Nati’s treats page, watched police helicopters and show planes, ate dinner, read, complained about the cold (mostly me), watched the early fireworks, played “Heads Up,” complained about the low battery life of all our devices, napped (mostly Todd and Nati), and finally had to talk to each other. The 9:00 fireworks came from barges on either side of the bridge, and the highlights were probably the ones shaped like birds. Next came a boat parade. The midnight fireworks were spectacular, lasting 12 minutes. They also mostly came from the barges, with intense bursts coming from the bridge. 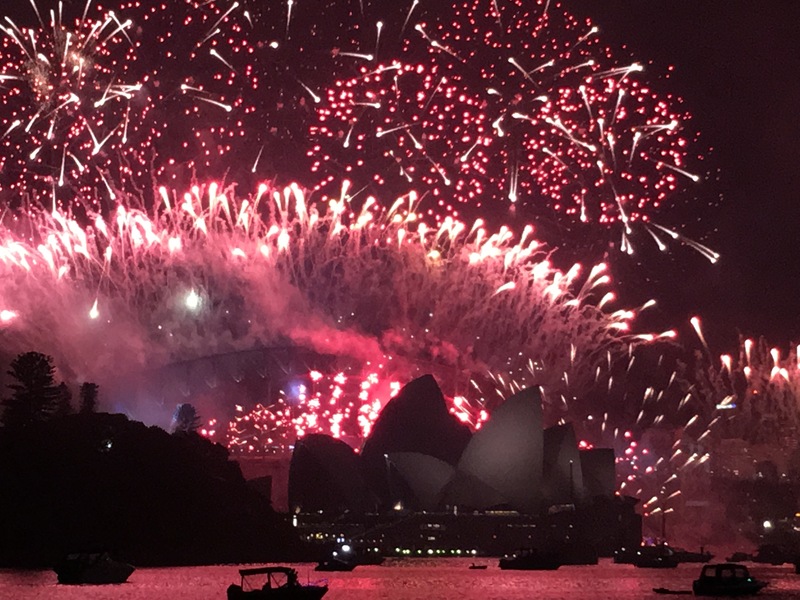 The opera house blocked the fireworks that shot down, but everything else was amazing. And then, the walk home. Definitely one for the books. As good as last year’s ‘80s party. What has been your most memorable (good or bad) New Year’s Eve? Happy New Years’ Thiessens! We thought of you this morning, as we watched the news in our hotel room in NY. Sydney fireworks were on & Pao said, it’s already 2016 for Nati! Thank you Paola. I really miss you. Amazing beginning to the trip and year! Todd if you have time go to the Tronga zoo. With a beginning like that, you know 2016 will be a great year! We will toast to that at midnight in Connecticut. Cheers, mate! Is the St. Stephens mom Mrs. Meiser? I wish I was there for New Year’s. My mom didn’t let me stay up! Your trip sounds amazing. Yes, it was Miriam. It’s been fun so far, but it’s rainy today so we are going to our plan B for today. Sounds *spectacular*! Happy New Year! I know 2016 will be unforgettable and monumental for you all. Best wishes! Happy New Year!! Sydney sounds amazing! We played Heads Up too!!! Forget to mention this in Idaho…but try to order an appetizer called Dukkah. It is really an Egyptian spice and nut mixture, but the Aussie’s love it! You dip your bread in olive oil and then into this spice/nut mixture – very good! We miss you guys…and Curtis still loves to sort those shaker eggs into any kind of container – so thanks! PS ask Lucy if she remembers our passports and world travels. She loved it when we stamped her passport and asked if she was “traveling for business or pleasure” when learning about a continent or particular country! Now she’s traveling the world for real. Amazing! Sounds like a great day for you guys despite the long wait… Our New Year’s wasn’t as exciting as yours since we didn’t really celebrate it but we were happy and together! We had just spend time in Florida and flew home on the 31st. We got home late at night exhausted and ended up eating and falling asleep before midnight! Glad you are having fun!